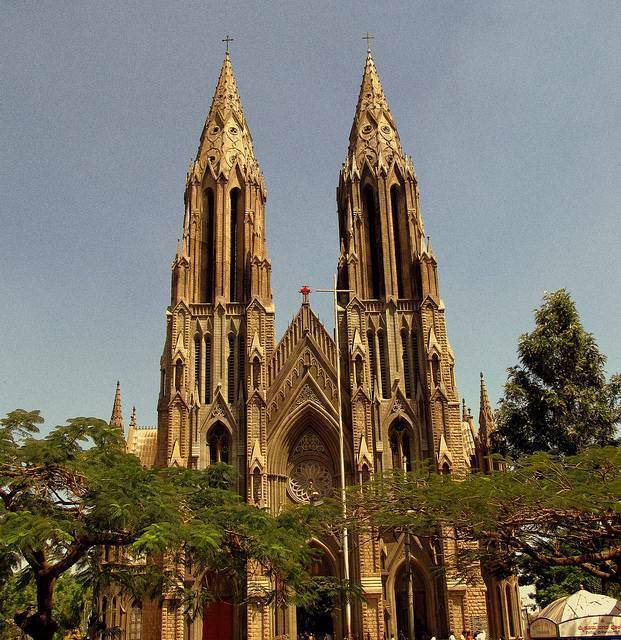 St. Philomena Church is in Mysore or Mysuru is originally over 200 years old, but rebuilt in 1936 in present Neo Gothic style and its architecture is inspired by the Cologne Cathedral in Germany. Wodeyar Maharaja gave the plot for this church to be built by British people settled in Mysore. The cathedral built in honor of St. Philomena houses a statue of St. Philomena. The floor plan of the church resembles a cross and church was designed by a Frenchman named Daly. St. Philomena Church is a good example of blending of local culture, one can see many female statues are shown wearing local traditional dress, Saree. The main hall of the church is big enough to seat 800 people and its stained glass windows, depict scenes from Last Supper, the Crucifixion, and the Resurrection etc. Some people believe this to be Asia's second largest church. Here Holy Mass is conducted in 3 languages namely Kannada, Tamil & English. It possess the remnant of St. Philomena of 3rd century under its altar.